Unfortunately, the code doesn’t works as expected in Internet Explorer 9 (thankfully, the lower versions are not supposed to be supported by the project, so I don’t care about them). If IE9 sends an Ajax request to the Web Api method, it interprets the JSON response correctly. However, when uploading a file, the jQuery File Upload plugin sends traditional non-Ajax form POST. So, having received the JSON result, IE9 prompts for a JSON file download. If you want to disable a MVC Controller, not deleting it, a good way to do that is apply a custom ActionFilter-derived attribute to it. Don’t confuse the ActionFilterAttribute defined in the System.Web.Mvc (the one we’re going to use) with the attribute of the same name residing within the Web API infrastructure, namely in the System.Web.Http.Filters namespace. 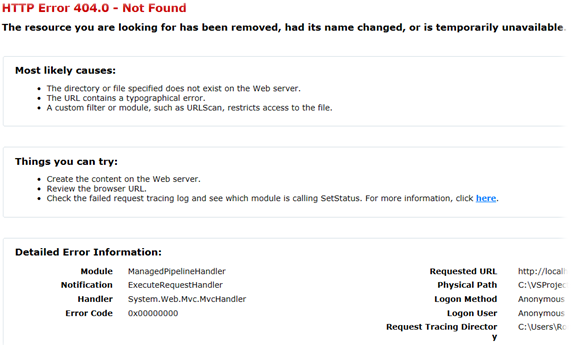 Calling any action of such MVC contoller, user gets the 404 Http Status Code page. The page could look differently depending on which way you use to return the Status Code. 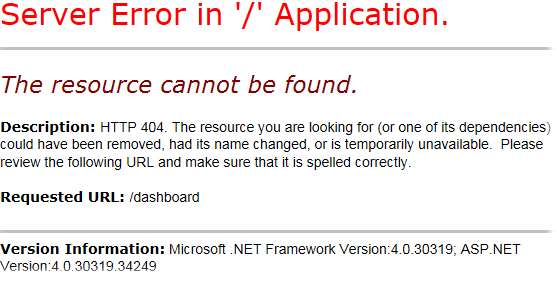 Using the first line of code in the DisableControllerAttribute.OnActionExecuting (currently commented), the IIS “native” 404 page will be returned. Throwing the HttpException like shown in the second line of the DisableControllerAttribute.OnActionExecuting (uncommented), you’ll get the ASP.NET handled page. In addition to the article SharePoint: SqlMembershipProvider – Get All Users In Role, here is one more method to extend the SqlMembershipProvider with. It’s found out that the SqlMembershipProvider doesn’t provide a method to lock user. By default a user can be automatically locked after several frequent and failed attempts to login. To unlock such users the SqlMembershipProvider supplies with the UnlockUser method. But what if administrator wants to temporarily lock user for some reason? Unfortunately, there is no such method out-of-box. So, let’s try to implement our own LockUser method. Two obvious steps for that are as follows: to create a Stored Procedure in database; to extend a class derived from the SqlMembershipProvider with the proper method. The stored procedure is very simple as we need just to update one field in the aspnet_Membership table for appropriate user. Below is the script to create such procedure. Run the script on MembershipProvider database, in my case it’s aspnetdb. Now we can add the LockUser method to the custom Membership Provider called SqlMembershipProviderEx and shown in the article. The SqlMembershipProviderEx with the LockUser is listed below. Note that the methods mentioned in the previous article are skipped. The ValidatorValidate makes the passed validator examine the input element bound to it and updates the validator‘s display (shows or hides its error message). I also recommend to call the ValidatorUpdateIsValid method, which updates the global variable Page_IsValid and by that may prevent the Html-form submit when the validator failed. ASP.Net places the initialization of validators at the end of the web page, so, it makes sense to handle the input‘s Validators-collection after the page has been loaded entirely. The following example demonstrates how to fire validation of the specified input right after the page has been loaded. jQuery is a best helper in that. The ValidatorEnable calls sequentially the same ValidatorValidate and ValidatorUpdateIsValid functions we use above. Thus to activate one validator you can use, with no difference, either ValidatorEnable or combination of ValidatorValidate and ValidatorUpdateIsValid. But activating several validators (like in ForceInputValidation function) I advise employing the pair of the ValidatorValidate and ValidatorUpdateIsValid functions. That is because the ValidatorUpdateIsValid loops through all validators on the page. So, for best performance we should fire the all required validators and then call ValidatorUpdateIsValid once. ps here is good source of information about the client-side validation.